Enjoy fabulous hospitality in the Ballsbridge Hotel. See Ireland take on Grand Slam Six Nations Champions Wales in Dublin. After an abysmal display in Cardiff, Ireland will look to set the record straight against the defending champions. 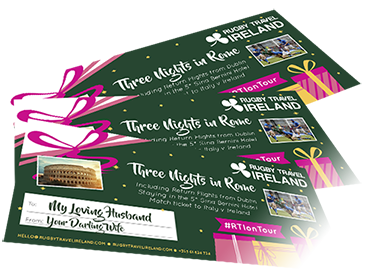 Enjoy hospitality in the excellent Ballsbridge Hotel, just a short walk to the Aviva Stadium. Included in our hospitality package is a pre match 4 course luncheon, post match hot buffet, complimentary pre and post match bar plus a special guest speaker (to be announced closer to the event). Enjoy a day of hospitality and rugby as we welcome you to the Ballsbridge Hotel for Ireland v Wales. Just a short walk to the Aviva Stadium, you can enjoy the pre match luncheon, complimentary bar and guest speaker before making your way to see Ireland’s opening fixture of the 2020 Six Nations. After the match (KO 14:15), return to the event for a post match hot buffet and to relive Ireland v Wales on the big screen. The complimentary bar reverts to a cash bar 90 minutes after the final whistle.